Bollywood and Hallyuwood know how to style! 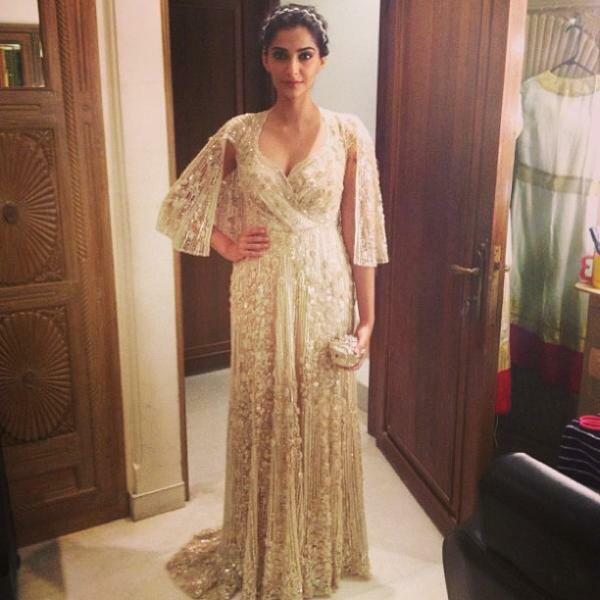 In January, Indian actress Sonam Kapoor dazzled in an elegant yet revealing evening gown by Shehlaa Khan. The pale color and long draped look is the perfect combination of western modern and uniquely Bollywood. The photo above was shared on the designer’s official Facebook Page. Girls Generation member Im YooNa took a dark old school turn. Her ensemble in the October 2012 issue of BAZAAR Korea reminded me of the style of the late 1990s. Her black midriff, leather jacket and skirt was the right mixture for any pop star of the past. The K-pop star hailing from South Korea channeled 90s pop stars to create a current trend. The two ladies have showcased two very different versions of upscale evening wear. Who has the best outfit? It’s your choice! All rights to the images belong to Shehlaa Khan and SM Entertainment. This entry was posted in Fashion, Music and tagged Girls Generation, Im YoonA, Sonam Kapoor. Bookmark the permalink.